Chelsea are top of the Premier League by 1 point from Liverpool and Man City after matchweek 13. After impressing the new boss in pre-season the winger was reinvented in Conte's all conquering 3-4-3 as a wing-back, and the rest is history. 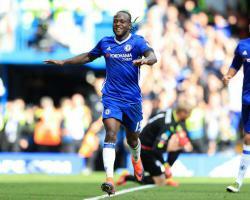 Moses has been ever-present as Chelsea has forged a seven-game winning streak that makes you wonder why he has been overlooked for so long. The Nigeria international joined Chelsea in 2012 for Â£9m from Wigan but he has enjoyed mixed fortunes until this season with Jose Mourinho not of the same opinion as his predecessors as to the qualities of the winger. The 25-year-old capped off a sensational performance by scoring the winning goal in the London derby with Spurs, ending their unbeaten run in the Premier League and keeping Chelsea top of the table. Voting is now open for the Sky Bet Championship PFA Fans' Player of the Month for November.